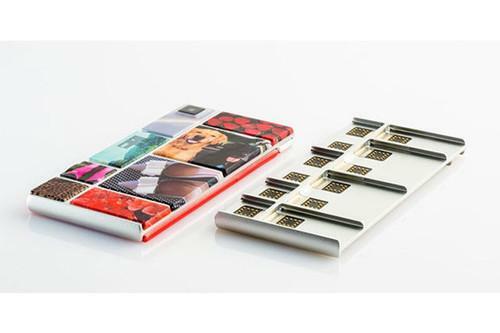 A series of cryptic Twitter messages implied changes are in store for Google's Project Ara. Shown here is a smartphone that's part of the program, which lets people piece together modular components to construct a device. The first phones coming from Project Ara, which is part of Google's Advanced Technology and Projects Group, were expected to go on sale in the Caribbean island during the third quarter as part of a pilot program. Google, however, is no longer launching the test program in the U.S. territory, spokeswoman Iska Saric said by email Friday. She declined to provide more details. A series of cryptic messages from Project Ara's Twitter account implied that changes were in store for the modular smartphone project, including a new venue for the program's first test market. Project Ara is undergoing a "market pilot re-route" with more information coming next week, said a tweet posted Thursday. Another tweet gave the impression that Project Ara would head back to Puerto Rico at some point, noting that the program wasn't saying goodbye and adding, in Spanish, that it would see the island in the future. Project Ara will let people purchase hardware modules, including processors, sensors, cameras and screens, and snap them together to create a customized smartphone. Google has said a basic smartphone frame would start at US$50. While these tweets could imply Google may nix plans for creating a do-it-yourself smartphone, a message said "Project Ara isn't going anywhere" and is just "recalculating." Google used similar language after it stopped selling Glass to consumers, saying products that fail to meet certain benchmarks but have potential are "reset." In fact, Project Ara has been "busy ... making stuff" and that's the reason why its Twitter account has been silent since late May, according to another tweet. Before Thursday, the last Twitter post from Project Ara was a photo of attendees at Google's I/O developer conference. That image was taken with a Project Ara smartphone assembled by a Google engineer during a presentation from the ATAP group. The Project Ara news comes after Google this week announced a sweeping reorganization that will create a holding company called Alphabet for its various businesses.